Does a famous fashion house even need a designer? Based on the Schiaparelli house&apos;s latest activities, it doesn&apos;t seem entirely necessary--at least not yet. Ever since the Met&apos;s "Schiaparelli and Prada: Impossible Conversations" exhibit was publicized, the house has enjoyed quite a bit of attention, even more so after May&apos;s well-timed announcement that the house would relaunch. Since then, the label has appointed a spokeswoman, socialite and muse Farida Khelfa, and CEO Camilla Schiavone. And today, they&apos;ve unveiled a decadent new Maison at 21 Place Vendôme, Schiaparelli&apos;s original location until the house shuttered in 1954. Based on WWD&apos;s photos, the "couture salons" look almost like a tasteful, high-end Schiaparelli theme park. There are bright colors (including shocking pink), surrealist art, an alligator-shaped bench and, of course, a lobster-shaped chest of drawers. The space was broken in with a "small cocktail party" with guests like Sharon Stone, Ines de la Fressange, Carine Roitfeld and Haider Ackermann. In addition to functioning as a space to hold private appointments with clients, Diego Della Valle (who acquired the house in 2006) plans to stage a small runway show there in January during couture. We guess this is what was meant when, in a press release back in May, the revival was described as a "new Schiaparelli universe." The Schiaparelli branding seems to be Della Valle&apos;s main focus and and will remain regardless of who designs the clothing and accessories. It seems safe to say that when a designer is appointed, it&apos;s not going to be Hedi Slimane at YSL situation. Click through for pics of Sharon Stone, Carine Roitfeld, Ines de la Fressange, Jean Paul Gaultier, Anna Dello Russo and more at last night&apos;s opening cocktail. A few weeks ago Diego Della Valle, the Italian businessman who's relaunching the Schiaparelli label, annoucned that he'd name a designer "soon." Well, it looks like "soon" just turned to "later," according to WWD. Farida Khelfa, who's a spokeswoman for the label, told editors at a luncheon in Paris that the first Schiaparelli show will be in "June or July." The first show had been tentatively planned for January, so that's a pretty significant delay. The reason? Nearly forty years after her death, Elsa Schiaparelli is once again the designer of the moment: She's the subject of this year's Costume Institute exhibit at the Met, and now, thanks to Italian businessman Diego Della Valle, her label is set to enjoy a revival later this year, WWD is reporting. Has Schiaparelli Finally Found a Designer? 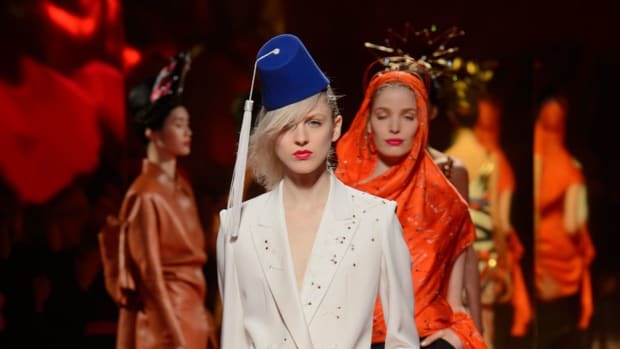 The Schiaparelli relaunch has sort of become the Great Gatsby of the fashion industry--we've been hearing about it forever, but nothing's really happened. It was said that a creative director would be named last September, and yet, nothing, until now. Schiaparelli's in-house team produced a collection that was much more modern than what we saw over the past year.